Whether the seas are calm or the surf’s up, where kitesurfing comes from, you’re on a board which is attached to a kite. Off you go! Kiteboarding, as it is most commonly referred, especially here in Southwest Florida, is a watersport that’s an epic combination of wake and snow-boarding, windsurfing and traditional surfing, with a little paragliding thrown in and a familiarity with skateboarding and gymnastics wouldn’t hurt. But bottom line, you don’t have to have skills in any of these to kiteboard; virtually every kiteboarding business in the 941 offers lessons. Kitesurfing has a much longer history than boarding; in the 1970s two brothers in France developed kites for kite-surfing. Over the decades, kitesurfing became popular but was mostly seen in places like Hawaii. But around 1999, single direction boards, like wake boards or small surfboards, paved the way for kiteboarding; riding on relatively flat water, perfect for Gulf Coast beaches and shorelines. Kiss The Sky Kiteboarding, with a 941 area code but whom provides lessons throughout the Tamps Bay area, says no experience is necessary. The first open water lesson is focused on safety and while being fit is a plus, extreme upper body strength is not a pre-requisite. And no, they say, they never worry about sharks. 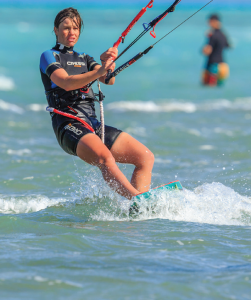 Some kiter shops’ lessons are mobile depending on weather and water conditions and most hold first open-water classes on the flattest, shallowest water possible so the student gets acclimated. Jet-skis and/ or pontoon boats and the like are nearby for that first open water lesson. The length of time it takes to master kiteboarding varies widely; for some, it may take just 5 or 6 hours, for others, perhaps 15. The idea is to feel confident and safe. And, in all cases, especially in the 941 kiteboarding schools, the instructors are certified by the Professional Air Sports Association. Lessons are not cheap; private classes can go as high $400 for a 2-hour lesson, but group classes can be significantly less and often quite affordable. Learn more about kiteboarding from the PASA website at PasaKiteboarding.org. Check out the International Kiteboarding Organization (IKO), the global group that helps promote kiteboarding worldwide at IkoIntl.org. Share your kiteboard pics and videos on Facebook @Fit941 and Instagram @Fit941.